SNHR said in a report released today that about 3 million residences have been destroyed completely or almost completely. 90% have been destroyed by Syrian regime forces and Russia. Entitled: “Satellite Imagery Proves that Russian Attacks Have Exterminated Entire Eastern Ghouta Towns”, the report notes that the offensive on Eastern Ghouta that started in last February was the most brutal of all the attacks that have been carried out by the Syrian-Russian-Iranian alliance forces since the popular uprising for freedom broke out in Syria in March 2011. The report notes that the Syrian regime and Russia deliberately made sure to bomb and destroy as many residencies, especially vital facilities, as possible. Most of these air attacks, the report adds, were devoid of any military justification as per the law of war, as this wide destruction was a deliberate tactic, the purpose of which was to send a message to the areas that were thinking of trying to break away from the Syrian regime’s control that your fate will only be destruction and doom, and that no one will protect you, not the UN or the Security Council. The report stresses that approximately 3 million residences have been destroyed completely or almost completely in Syria. The report adds that millions of Syrians have lost their homes. losing ‘a home’ for many Syrians means that quarter of a century of labor and hard work, just to acquire a house, has just gone to waste. According to the report, that destruction has been used by the Syrian regime in a widespread manner as a scheming tool against everyone who revolted against it, where the Syrian regime aimed, through this destruction, to end and shatter all forms of dissidence, and demolish the entire society. The Syrian regime and its allies have always enjoyed the upper hand from a military standpoint, particularly for possessing an air force, which made them the best suited and most capable of engineering the destruction operations. The report breaks down the towns of Eastern Ghouta and the barbarian and savage destruction they’ve suffered at the hands of Russia, primarily, and the Syrian regime and Iran. 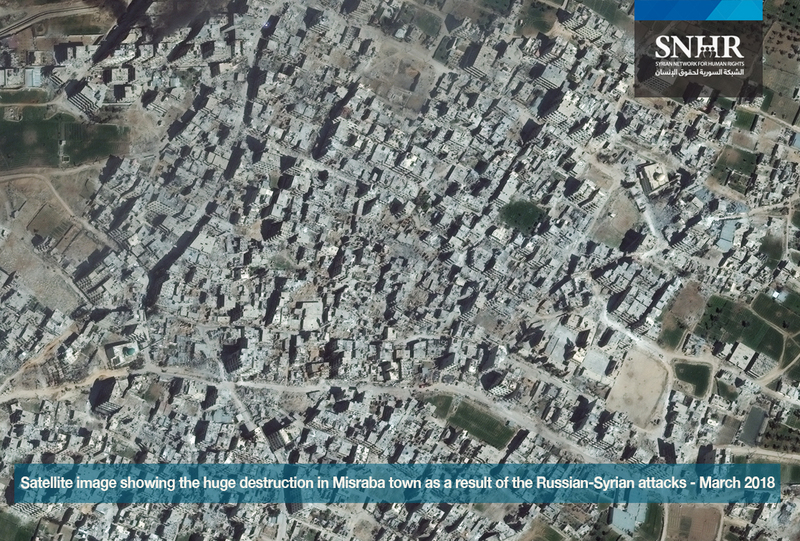 The report compares between the destruction these areas suffered between the start of the siege in October 2013 and March 2018, while including satellite imagery. The report also contains a basic analysis for the military progression and the strategy implemented to take over the villages and towns of Eastern Ghouta. The report stresses that the Syrian regime and Russia have used various types of weapons to bomb the Syrian cities and towns, including artillery, tanks, helicopters, fixed-wing warplanes, scud missiles, thermobaric bombs, and cluster munitions among others. In addition, the report notes that the overall tally of barrel bombs dropped by the Syrian regime on the Syrian lands have been 70,000 barrel bombs at least, which equals seven atomic bombs at least. The report notes that Syrian-Russian alliance forces used a number of types of weapons which are internationally prohibited or the use of which are prohibited in populated areas. The report outlines the most notable types of ammunitions that were used between February 18, 2018, and April 12, 2018, as the report records 3,968 surface-to-surface rockets, approximately 1,674 barrel bombs, 5,281 mortar and artillery shells, four explosive houses, 60 missiles loaded with incendiary ammunitions, and 45 missiles loaded with cluster munitions. Moreover, the report analyses the strategy adopted by Syrian-Russian alliance forces in the battle of Eastern Ghouta and outlines the most prominent land forces that were involved in the raiding and looting, while highlighting the most notable patterns of violations perpetrated by Syrian-Russian alliance forces in Eastern Ghouta from the start of the offensive until it ended – February 18, 2018, until April 12, 2018. According to the report, Syrian-Russian alliance forces killed 1,843 civilians, including 317 children and 280 women (adult female), 15 medical personnel, and 12 civil defense personnel in the period of time covered by the report. The report adds that no less than 68 massacres were perpetrated by the same forces, in addition to 61 attacks on vital civilian facilities. The report stresses that Syrian-Russian-Iranian alliance forces have, beyond any doubt, violated Security Council Resolution 2401 which states that hostilities must be ceased, as well as the preceding Resolutions 2139 and 2254 which state that indiscriminate attacks must end. Also, these forces violated, through the crime of willful killing, Article 7 and 8 of Rome Statute, which constitutes war crimes. The report adds that these forces have used indiscriminate and highly-destructive weapons, as well as prohibited weapons such as cluster munitions and chemical weapons. The report says that the bombardments has resulted in collateral damages that involved the casualties, injuries, or significant damages to civilian objects. There are strong indicators suggesting that the damage was too excessive compared to the anticipated military benefit. The report calls on the Security Council to adopt a binding Resolution that prevents and punishes the crime of forced displacement, and puts an end to the forced displacement operations, while explicitly states that IDPs have the right to a safe return to their homes, and that the damages that they had to suffer should be compensated. Additionally, the report calls on the Security Council to bind the Syrian regime to cease settlement and demographic replacement operations in the cities and neighborhoods whose residents have been displaced. The report emphasizes that the case in Syria should be referred to the International Criminal Court and all those who were implicated should be held accountable. Also, peace and security should be instilled, and the ‘Responsibility to Protect (R2P) norm’ should be implemented in order to save the Syrian people’s lives, heritage, and arts from being destroyed, looted, and ruined. Further, sanctions should be expanded to include the Syrian, Russian, and Iranian regimes who were directly involved in perpetrating crimes against humanity and war crimes against the Syrian people. The report calls on the OHCHR to help with establishing a central data for residencies and properties in Syria in order to achieve compensation and carry out voluntary return programs in accordance with the UN’s “Principles on Housing and Property Restitution for Refugees and Displaced Persons” known as the Pinheiro Principles.